A complete rails-foundation example application is available from the RailsApps project. There’s no need to copy code from this article, just use the rails-foundation example application. The RailsApps project provides example applications that developers use as starter apps. Hundreds of developers use the apps, report problems as they arise, and propose solutions. Rails changes frequently; each application is known to work and serves as your personal “reference implementation.” Support for the project comes from subscribers. If this article is helpful to you, please join the RailsApps project to support our work. Zurb Foundation is packaged as a gem. We’ll use the rails_layout gem to generate files for an application layout, navigation links, and flash messages styled with Foundation CSS classes and layout. You don’t need the rails_layout gem deployed to production, so put it in the development group. Run $ bundle install in the Terminal. Rather than following the installation instructions provided in the Foundation Documentation, we’ll use the rails_layout gem to set up Zurb Foundation and create the files we need. Our approach is slightly different from the Zurb instructions but yields the same results. With the --force argument, the rails_layout gem will replace existing files. Let’s examine the files to see how our application is configured to use Zurb Foundation. The rails_layout gem renamed the app/assets/stylesheets/application.css file as app/assets/stylesheets/application.css.scss. Note the .scss file extension. This will allow you to use the advantages of the Sass syntax for your application stylesheet. Stylesheets can use variables, mixins, and nesting of CSS rules when you use Sass. For more on the advantages of Sass and how to use it, see the Sass website or the Sass Basics RailsCast from Ryan Bates. Sass has two syntaxes. The most commonly used syntax is known as “SCSS” (for “Sassy CSS”), and is a superset of the CSS syntax. This means that every valid CSS stylesheet is valid SCSS as well. You can use Sass in any file by adding the file extension .scss. The asset pipeline will preprocess any .scss file and expand it as standard CSS. Before you continue, make sure that the rails_layout gem renamed the app/assets/stylesheets/application.css file as app/assets/stylesheets/application.css.scss. Otherwise you won’t see the CSS styling we will apply. The app/assets/stylesheets/application.css.scss file serves two purposes. First, you can add any CSS rules to the file that you want to use anywhere on your website. Second, the file serves as a manifest, providing a list of files that should be concatenated and included in the single CSS file that is delivered to the browser. Any CSS style rules that you add to the app/assets/stylesheets/application.css.scss file will be available to any view in the application. You could use this file for any style rules that are used on every page, particularly simple utility rules such as highlighting or resetting the appearance of links. However, in practice, you are more likely to modify the style rules provided by Zurb Foundation. These modifications don’t belong in the app/assets/stylesheets/application.css.scss file; they will go in the app/assets/stylesheets/framework_and_overrides.css.scss file. In general, it’s bad practice to place a lot of CSS in the app/assets/stylesheets/application.css.scss file (unless your CSS is very limited). Instead, structure your CSS in multiple files. CSS that is used on only a single page can go in a file with a name that matches the page. Or, if sections of the website share common elements, such as themes for landing pages or administrative pages, make a file for each theme. How you organize your CSS is up to you; the asset pipeline lets you organize your CSS so it is easier to develop and maintain. Just add the files to the app/assets/stylesheets/ folder. It’s not obvious from the name of the app/assets/stylesheets/application.css.scss file that it serves as a manifest file as well as a location for miscellaneous CSS rules. For most websites, you can ignore its role as a manifest file. In the comments at the top of the file, the *= require_self directive indicates that any CSS in the file should be delivered to the browser. The *= require_tree . directive (note the Unix “dot operator”) indicates any files in the same folder, including files in subfolders, should be combined into a single file for delivery to the browser. If your website is large and complex, you can remove the *= require_tree . directive and specify individual files to be included in the file that is generated by the asset pipeline. This gives you the option of reducing the size of the application-wide CSS file that is delivered to the browser. For example, you might segregate a file that includes CSS that is used only in the site’s administrative section. In general, only large and complex sites need this optimization. The speed of rendering a single large CSS file is faster than fetching multiple files. It added the directive //= require foundation before //= require_tree .. The file app/assets/stylesheets/framework_and_overrides.css.scss is automatically included and compiled into your Rails application.css file by the *= require_tree . statement in the app/assets/stylesheets/application.css.scss file. The @import "foundation"; directive will import the Foundation CSS rules from the Foundation gem. You could add the Foundation @import code to the app/assets/stylesheets/application.css.scss file. However, it is better to have a separate app/assets/stylesheets/framework_and_overrides.css.scss file. You may wish to modify the Foundation CSS rules; placing changes to Foundation CSS rules in the framework_and_overrides.css.scss file will keep your CSS better organized. In addition to the simple @import "foundation"; directive, the app/assets/stylesheets/framework_and_overrides.css.scss contains a collection of Sass mixins. These are examples that you can remove. You can use Sass mixins to map Foundation class names to your own semantic class names. The rails_layout gem provides examples of Sass mixins that apply CSS style rules to the default application layout. In doing so, the default application layout is free of framework-specific code and can be used with Zurb Foundation, Bootstrap, or other front-end frameworks. The book Learn Ruby on Rails explains how to use Sass mixins. Now that you’ve installed Zurb Foundation, you have a rich library of interactive effects you can add to your pages. At a simpler level, Foundation provides a collection of carefully-crafted styling rules in the form of CSS classes. These are building blocks you use for page layout and typographic styling. For example, Foundation gives you CSS classes to set up rows and columns in a grid system. Let’s take a closer look at the Foundation grid system. By default, the Foundation grid is 940 pixels wide. Two grids are available; “small” for browsers less than 768 pixels in width, and “large” for all others. Start by designing for the small screen with the classes prefixed “small”; then add classes prefixed “large” to change the layout for a large screen. The layout will change when the browser width is less than 768 pixels wide. The grid gives you 12 columns by default. You can organize your layout in horizontal and vertical sections using row and columns classes. The Foundation row class will create a horizontal break. The footer will contain two side-by-side sections. The first will be four columns wide; the second will be eight columns wide. To better understand the grid system with all its options, see the documentation for the Foundation Grid. Generating a new Rails application with the rails new command will create a default application layout. Rails will use the layout defined in the file app/views/layouts/application.html.erb as a default for rendering any page. 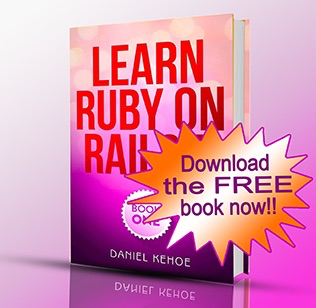 The book Learn Ruby on Rails covers the application layout file in detail. If you use the Sass mixins provided by the rails_layout gem in the app/assets/stylesheets/framework_and_overrides.css.scss file, there’s no need to use Foundation classes directly in the application layout (Foundation classes will be applied to the HTML element main). See the documentation for the Foundation Grid. Rails provides a standard convention to display alerts (including error messages) and other notices (including success messages), called a flash message. The name comes from the term “flash memory” and should not be confused with the “Adobe Flash” web development platform that was once popular for animated websites. Rails uses :notice and :alert as flash message keys. Foundation provides a base class alert-box with additional classes success and alert. A bit of parsing is required to get a Rails “notice” message to be styled with the Foundation success style. Any other message, including a Rails “alert” message, will be styled with the Foundation alert style. You can include code to display flash messages directly in your application layout file or you can create a partial. We use each to iterate through the flash hash, retrieving a name and msg that are passed to a block to be output as a string. The expression if msg.is_a? (String) serves as a test to make sure we only display messages that are strings. We construct a div that applies Foundation CSS styling around the message. Foundation recognizes a class alert-box and round (for rounded corners). A class of either success or alert styles the message. Rails notice messages will get styled with the Foundation success class. Any other Rails messages, including alert messages, will get styled with the Foundation alert class. We use the Rails content_tag view helper to create a div containing the message. Foundation provides detailed documentation if you want to change the styling of the alert boxes. The layout and styling required for the Foundation navigation bar are in the navigation partial file. The navigation partial includes layout and Foundation classes needed to produce a responsive navigation bar. The responsive navigation bar adjusts to different browser widths. At small sizes, the navigation links will disappear and be replaced by an icon labeled “Menu.” Clicking the icon will reveal a vertical menu of navigation links. The navigation menu is a great demonstration of the ability of Zurb Foundation to adjust to the small screen size of a tablet or smartphone. If you’d like to add a site name or logo to the tutorial application, you can replace the link helper <%= link_to 'Home', root_path %>. It is important to preserve the enclosing layout and classes, even if you don’t want to display a site name or logo. The enclosing layout is used to generate the navigation menu when the browser window shrinks to accommodate a tablet or smartphone. We wrap the nested partial render 'layouts/navigation_links' with a Foundation class to complete the navigation bar. The navigation links partial is simply a list of navigation links. It doesn’t require additional CSS styling. By separating the links from the styling that creates the navigation bar, we segregate the code that is unique to Zurb Foundation. In the future, if the Zurb Foundation layout or CSS classes change, we can make changes without touching the navigation links. Rails provides a set of view helpers for forms. They are described in the RailsGuides: Rails Form Helpers document. Many developers use an alternative set of form helpers named SimpleForm, provided by the SimpleForm gem. The SimpleForm helpers are more powerful, easier to use, and offer an option for styling with Zurb Foundation. Here the SimpleForm gem uses the rails generate command to create files for initialization and localization (language translation). SimpleForm can be customized with settings in the initialization file. Frameworks such as Foundation are intended to provide the building blocks for a custom website design. If you’ve got strong design skills, or can partner with an experienced web designer, you can develop a custom design that expresses the purpose and motif of your website. If you don’t have the skill or resources to customize the design, you can use the generic Foundation design. Stack Overflow is a popular site for questions and answers about Zurb Foundation. Was the article useful to you? Follow @rails_apps on Twitter and tweet some praise. I’d love to know you were helped out by the article. You can also find me on Facebook or Google+.